Audi Service Training information is now available from Bentley Publishers. 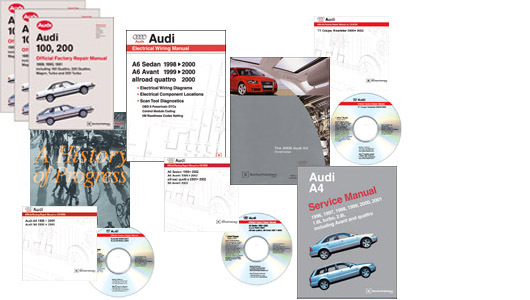 These Audi Technical Training Self-Study Programs (SSP) contain valuable technical information on Audi technology, ranging from Audi A6 2005 - Vehicle Introduction to How to Read Wiring Diagrams Symbols, Layout and Navigation. They are filled with colorful photos, diagrams, charts and drawings. Audi: A History of Progress chronicles the fascinating history of Audi AG, from its beginnings in Germany in 1909 to its unique place in the market today. Bentley is now featuring online discussion forums where you can communicate directly with the folks who brought you your favorite manual. Ask us questions about our manuals or about your car. We'd like to hear from you. Check it out now at BentleyPublishers.com/tech.